Thank you for your interest in helping us continue to protect the South Carolina Upstate. Naturaland Trust is a registered 501(c)3 non-profit organization and we depend heavily on independent contributions. Tens of thousands of people each year are able to enjoy the landscapes and wildlife we've helped to protect over the last 40 years. 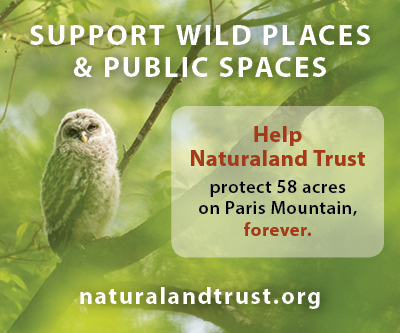 Our mission remains the same and we need your support to ensure the protection of these mountain wildernesses for generations to come. We pledge that your generous donation will go directly toward land conservation initiatives. Help us to achieve our goals by clicking the link below. All donations are tax deductible.